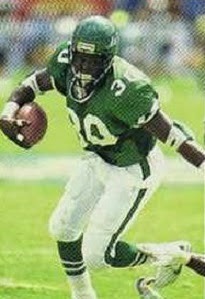 Baxter was chosen by the Minnesota Vikings in the 11th round of the 1989 NFL draft, was cut in the preseason, and signed to the Jets’ developmental squad. He was activated for one game. Considered a longshot to make the team in ’90, Baxter instead moved into the starting lineup and rushed for 539 yards while also providing solid blocking. Jets went 8-8 to finish second in the AFC East and qualify for the postseason as a Wild Card entry. Lost AFC Wild Card playoff to Houston Oilers (17-10). Baxter followed up in 1992 by rushing for a career-high 698 yards while averaging 4.6 yards per attempt and contributed 559 yards in ’93, scoring a total of 13 touchdowns over the two seasons. His production dropped considerably in 1994 as he was used more as a short-yardage runner and split time with Richie Anderson, and after another mediocre rushing season in 1995, Baxter was waived during the ’96 preseason. He failed to catch on with the Eagles in 1997, thus ending his career. Overall, he ran for 2928 yards on 779 carries (3.8 avg.) and caught 80 passes for 587 yards (7.3 avg. ), scoring 35 touchdowns, all by rushing.